Pomelo or Pummelo is the largest citrus fruit around, measuring up to 30 cm or more in diameter and usually weighing 1-2 kilograms. 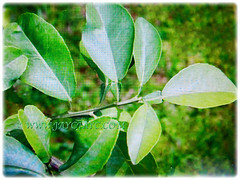 Botanical Name: Citrus maxima (syn. 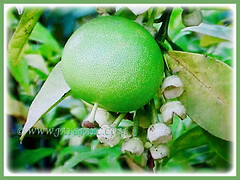 : Citrus grandis, Citrus decumana). 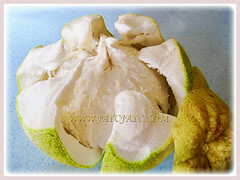 Common Names: Pomelo, Pomello, Pummelo, Limau Bali/Besar in Malay. Origin: Native to southern China, Southeast Asia including Malaysia. It is also cultivated elsewhere around the globe. Plant type: An ornamental, tropical and perennial tree with edible fruits. 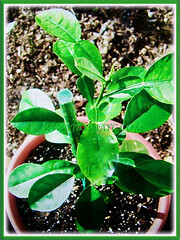 Features: Citrus maxima is from the genus Citrus that consists of 31 accepted species of trees. Thailand has produced numerous hybrids and cultivar. The pomelo tree may grow between 5-15 cm tall with low and irregular branches. Its 10-30 cm thick trunk is somewhat crooked. The young branchlets are angular and often densely hairy and usually have spines on the branchlets, old limbs and trunk. The 5-20 cm long and 2-12 cm wide leaves are obovate or elliptical, leathery, dull-green and glossy above, dull and minutely hairy beneath. Leaf petiole are distinctly winged. The 4-5 petaled flowers are highly fragrant, borne singly or in clusters of 2-10 in the leaf axils or sometimes 10-15 in terminal racemes 10-30 cm long. Rachis and calyx are hairy. 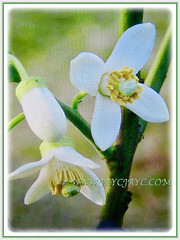 1.5-3.5 cm long yellowish-white and bisexual flowers are somewhat hairy on the outside and dotted with yellow-green glands. Stamens are white, prominent and in bundles of 4-5 with orange anthers. It flowers 2-3 times annually in the tropics with flowering season coinciding with shoot growth flushes. The 10-30 cm wide waxy fruit ranges from globular to pear-shaped and ripen to yellow or orange. The easily removed 1.25-2 cm thick but soft peel may be coloured greenish-yellow or pale-yellow, minutely hairy and dotted with tiny green glands. 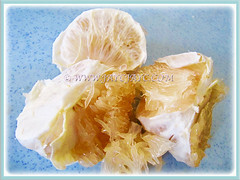 Its pillow-soft pith varies from greenish-yellow to pale-yellow with pink pulp-vesicles filled with sweet juice. It is divided into 11-18 segments, very juicy to fairly dry. Segments are easily skinned and the sacs may adhere to each other or be loosely joined. The enveloping membranous material around the segments is bitter, considered inedible and should be discarded. The flavour varies from sweet to somewhat acidic and sometimes with a faint touch of bitterness. Generally, there are only a few large, ridged and yellowish-white seeds inside. When ripe, the fruit’s flesh is sweet, coloured white or pinkish. 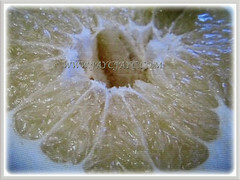 It is a large citrus fruit, 15-25 cm in diameter and usually weighing 1-2 kilograms. 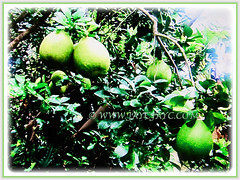 Culture (Care): Citrus maxima or Pomelo can be grown easily with least maintenance. Light: Best in full sun for optimum growth and fruit production. It can tolerate semi-shade but will produce less fruits. Moisture: Moderate water requirements. Water regularly and thoroughly. 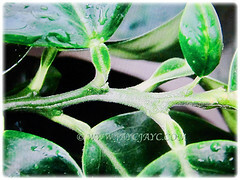 Overwatering, under watering or inconsistent watering may lead to blossom and fruit drop. Soil: Humus-enriched, loamy and well-drained soils. However, it can tolerate a wide range of soil types. Others: This beauty requires minimal pruning. Trim overcrowded branches to encourage bushy growth, control shape and stimulate flowering. Feed the tree once every three months with a high nitrogen fertiliser to stimulate flowering, resulting in abundant fruiting. Generally free from serious pests and diseases. Nevertheless, watch out for insect pests such as aphids, mealybugs, leaf miners, flea beetles, stinging red ant and scales red mites, fruit flies and nematodes. Citrus maxima or Pummelo is cultivated in many tropical and subtropical countries for its large fruits. It grows best in warm and a humid environment. It is the most cold-tolerant citrus species. It requires plenty of heat in summer and protection from winter temperature below -2°C. In non-hardy regions, grow the Pomelo plant in a container to easily overwinter indoors and locate it in a well-lit area. Propagation: Easily propagated from seeds, provided the seeds are not allowed to dry out before planting. Alternatively, it can be vegetatively propagated by air-layering or by budding onto rootstocks of Pummelo. 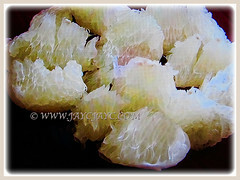 Usage: The sweet and juicy fruit of Citrus maxima or Pomelo is usually eaten fresh or used in fruit salads. The white inner part of the peel may be candied after the outer peel has been removed. The peel is sometimes used to make marmalade and can be candied. Pomelos are often eaten in Asia during the mid-autumn festival or mooncake festival. The skinned segments can be broken apart and used in salads and desserts or made into preserves. The extracted juice is an excellent beverage. The aromatic flowers are processed into perfume in Vietnam and the wood which is heavy, tough and hard-grained are used for making tool handles. Traditional medicinal uses of the fruit include treatment of coughs, fevers and gastrointestinal disorders. The hot leaf decoction is applied on swellings and ulcers. The pomelo fruit has lot many health benefits such as it boosts your immunity system; it lowers the cramping and balances the blood pressure.